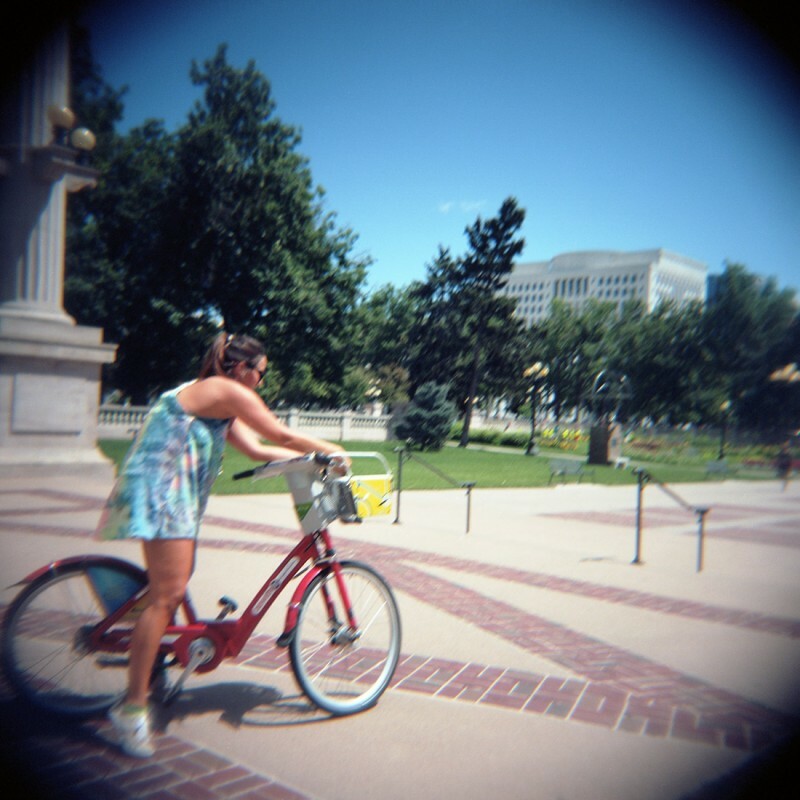 Holga Week 2015 ran from July 20-26, which overlapped nicely with Denver’s Underground Music Showcase (July 23-26). 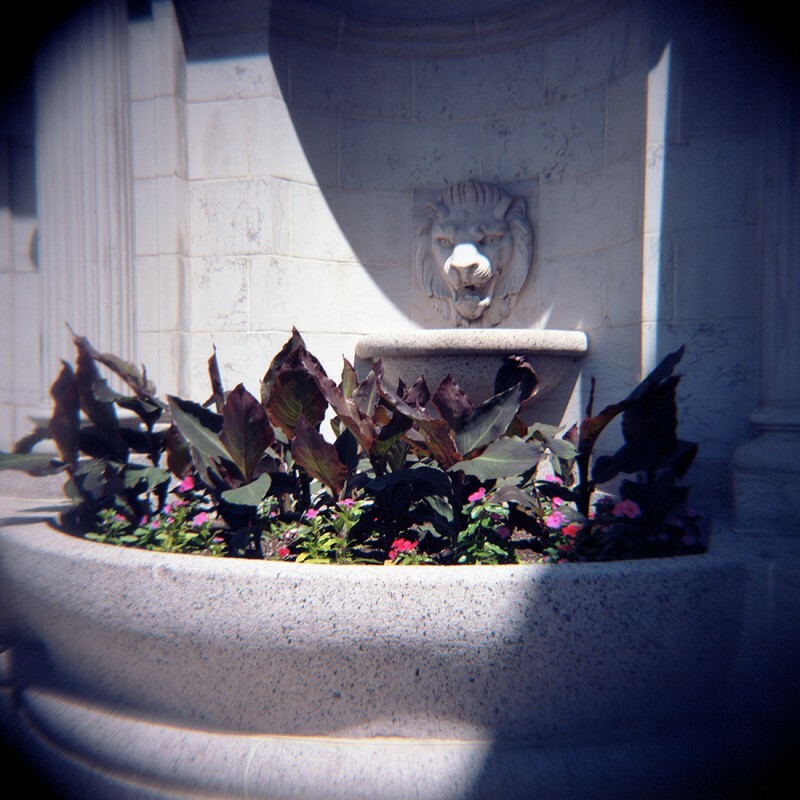 I broke out the Holga 120 CFN I’ve been hoarding for a while and made some pictures. 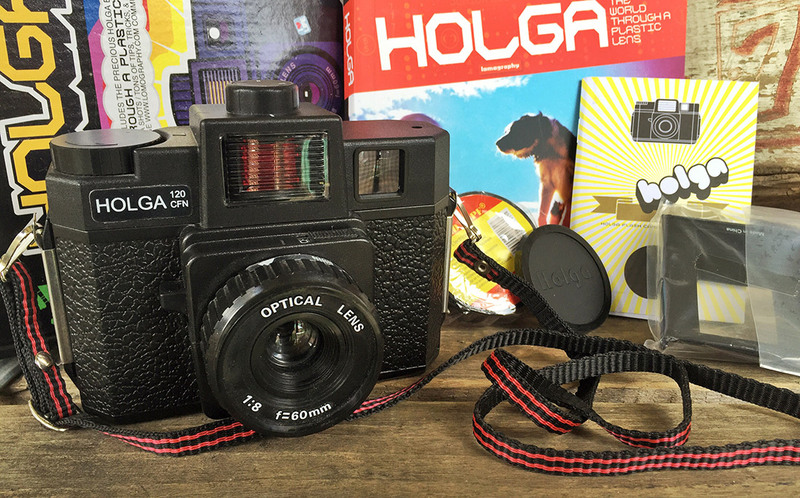 I’ve been meaning to review the Holga for quite a while, but I don’t have a whole lot new to say on this ubiquitous lo-fi lump, so this post will also serve as my review. I bought the Holga 120 CFN at a thrift store several years ago. It was in a glass showcase still in its packaging — a whole gift set with a book of Holga tips and history, a 6×4.5 mask, chintzy strap, batteries and even a roll of electrical tape for fixing some of those light leaks. The plastic wrapping hadn’t even been removed from the box. I really hadn’t been planning on buying a Holga. Early in my return to film, the Holga was rising to prominence as a hipster icon, and I was more interested in vintage and antique cameras. I felt like getting a Holga would be buying into a stereotype too much as film made its return through the trend-bucking trendster channels. 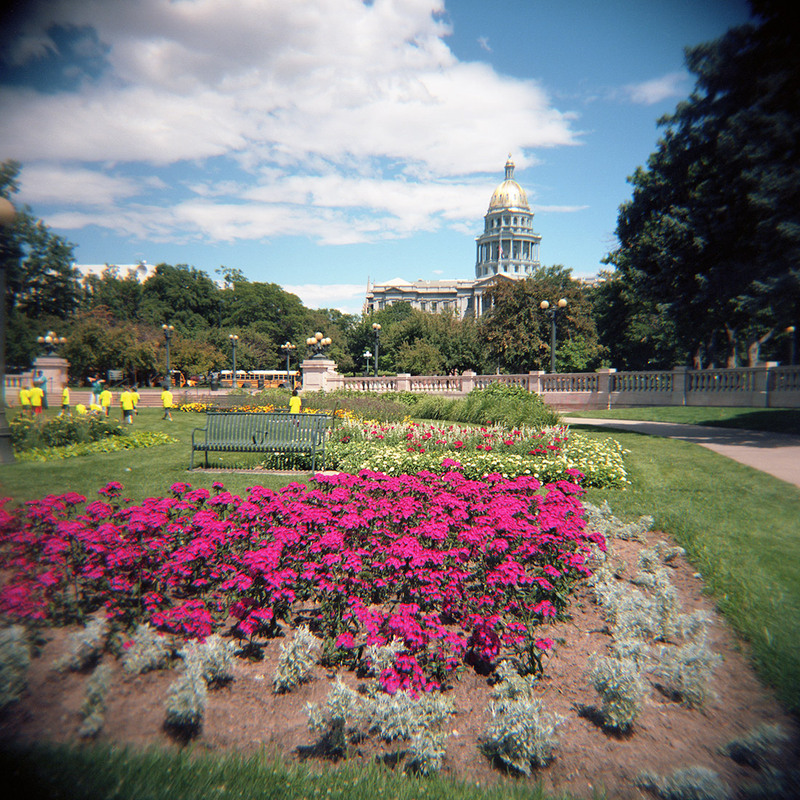 Besides, I reasoned, a 60-year-old Brownie was lo-fi because it just was; the Holga is lo-fi because it’s meant to be. That just didn’t feel as honest to me. But when I found such a great deal, I couldn’t pass it up. When it comes to cameras (and salty, carbohydrate-loaded junk foods like crackers) I’ve got really poor impulse control. As Holga Week approached, though, I was glad I had something I could use to join in. Holga Week is one of over a dozen annual events film photographers can participate in. I’m not great at actually taking part in these, but I’ve tried a few and will no doubt try more. Actually, I’m working on starting one of my own highlighting expired film. 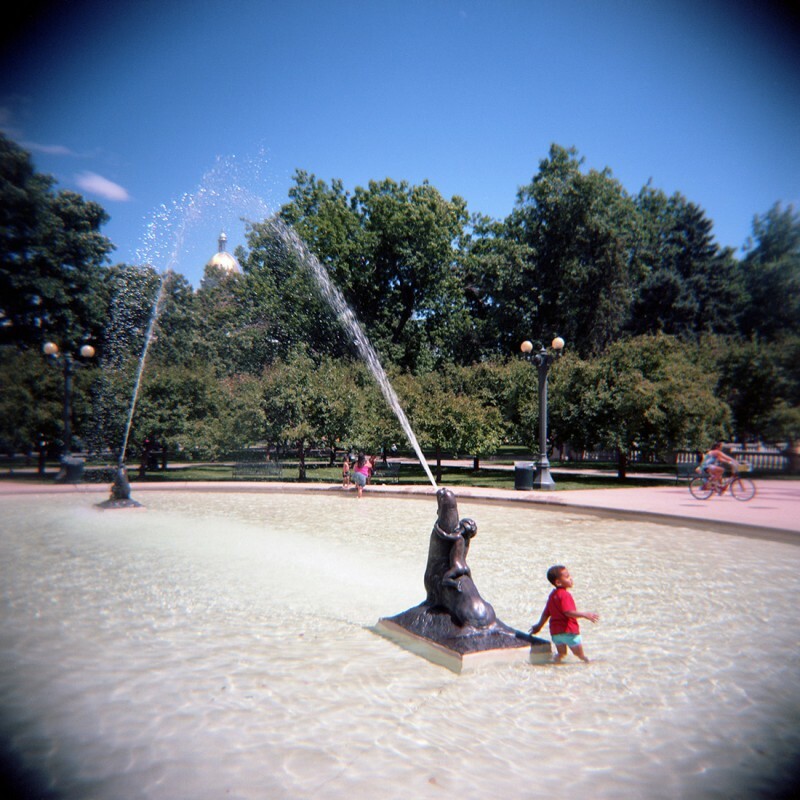 This was my first time participating in Holga Week. I tried in 2014, but I’m sort of not sure what happened to the film. I might’ve developed it and filed it away and forgotten to scan it, or I might’ve just plain lost it. To be honest, I haven’t looked very hard because I just wasn’t impressed the first time around. Determined to try it again, though, and more thoroughly, I took the Holga to work for a couple of days and then to The UMS on Thursday, July 23. My UMS time was pretty limited this year, but I had to make it out the first night to see one of my favorite local acts, Safe Boating is No Accident. Safe Boating’s set at the Irish Rover was short but full of energy — and it didn’t suffer the technical difficulties that plagued them during UMS 2014. They performed with another new drummer (not sure I’ve seen the same one twice) and, for the first time I’ve seen, a second guitarist. I was uncertain about the impact that might have on the stark three-piece I’d come to like, but it was good. Though I can’t remember the second guitarist’s name, his minimalist additions reminded me of Andy Summers (The Police) and the latest drummer was strong. I stuck around the Rover for a while and hung out with frontman Leighton Peterson for a bit before catching Blake Brown and the American Dust Choir. I’d never heard of the band, but I enjoyed their performance. I ran into some old friends during the show and convinced them to follow me to the Hi-Dive. Strawberry Runners, a band I’d read about in an article on The Denver Post’s music blog, was playing next. The article about lesser-known UMS acts to try out convinced me to spend an afternoon listening to the band’s releases and I was excited to see them live. I wasn’t disappointed. Singer and founder Emi Night’s breathy vocals and earnest lyrics were a good change of pace from the usual romance and youthy angst, and the band had a really good vibe musically. Their live set is more energetic and electric than their recordings had been, but both are good in different ways. 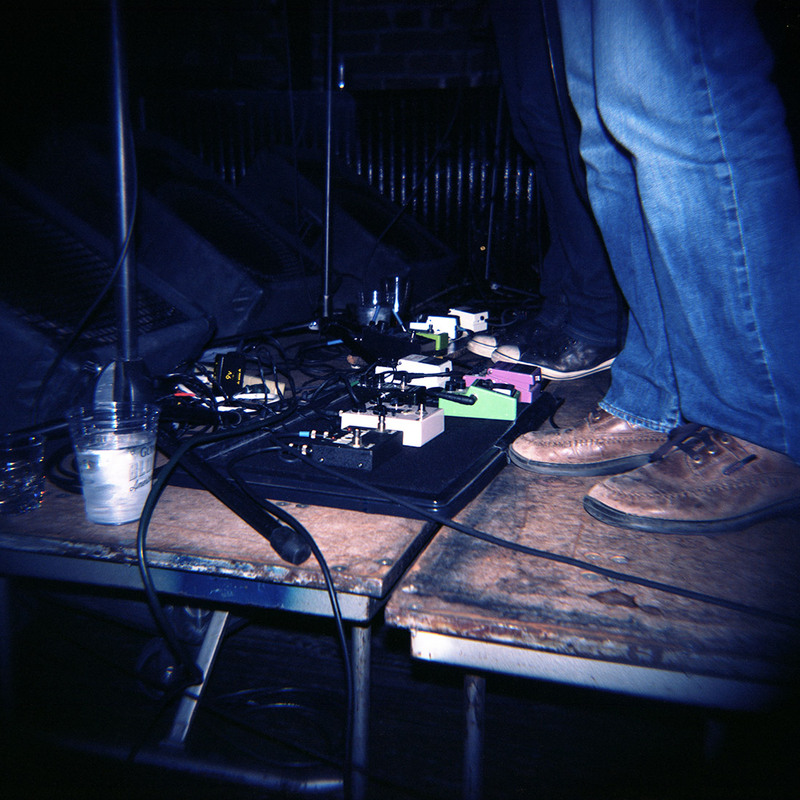 I had no trouble getting right next to the stage at the Irish Rover and snapping away with the Holga (and the Olympus XA2 I took along for its easy and reliable flash). 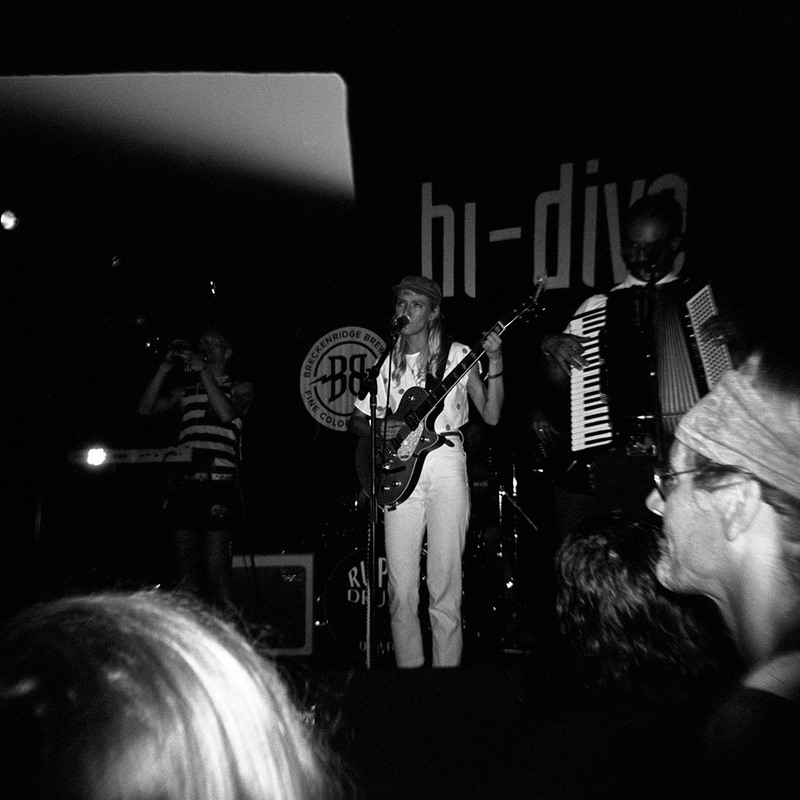 The Hi-Dive was a little tougher, but I tried a few “hold it up and pray” shots with the Holga that came out alright aside from the ginormous light leak the flash seems to produce. Outside the festival, I took a wander around Civic Center on a nice, warm day as kids played in the Seal Fountain at the Voorhies Memorial and people rode rented bikes through the park. 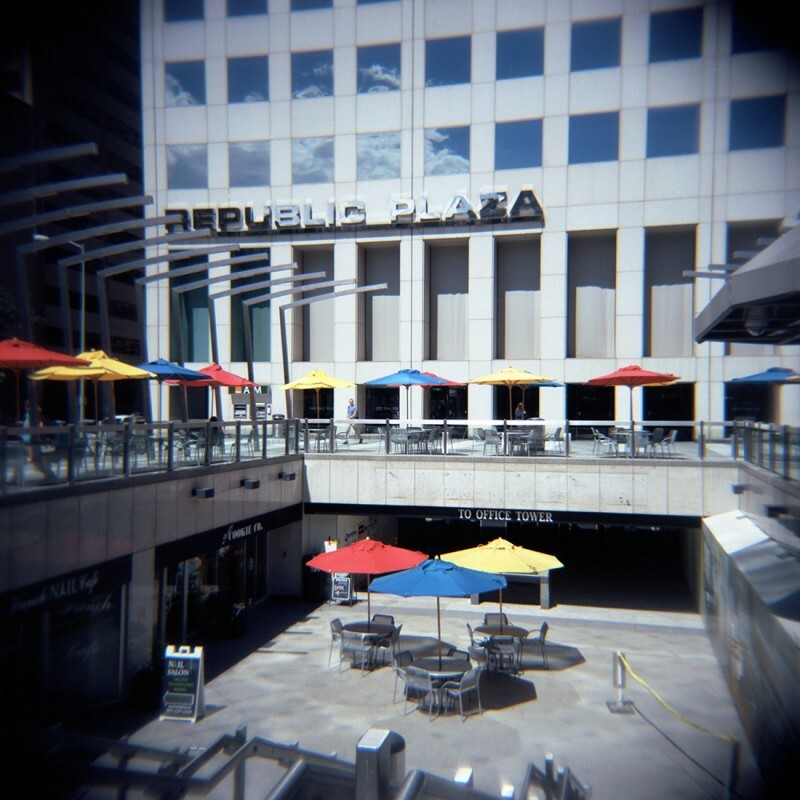 I also went up the 16th Street Mall on a couple of lunch breaks, looking for the brightly-colored umbrellas of the outdoor tables outside of Denver’s tallest building, Republic Plaza. I’ve used this scene for test shots with several cameras now (Pentax Spotmatic SP, Yashica-A TLR) and I like it more each time. It’s especially nice for color since the umbrellas are bright and bold red, yellow and blue. It certainly beats the Denver City and County Building shots I was duplicating before (and no longer can, as the Denver Post building has leased that floor to someone else and I no longer have access to the 10th floor patio). There are a lot of Holga features that don’t really change from model to model. It’s a China-made plastic box with a blurry plastic lens with vignetting so serious it makes Instagram filters look understated. It has two shutter speeds, selected by a switch marked “B” or “N” (iNstant) under the lens — bulb and 1/100 sec. (some sites put the instant speed at 1/125, but that’s a pretty insignificant difference). It also has two aperture settings, selected by a switch on the top of the lens “mount” projecting from the front of the camera — f/8 (marked with a cloud) and f/11 (marked with a sun). According to the sunny 16 rule, f/11 at 1/100 sec. should match ASA 50 film, although ASA 400 is much more commonly paired with the Holga from what I can see. I made the color photographs on this page with Kodak Ektar 100 and the exposures were really near spot on — if anything, overexposed by a touch. To me that supports the idea that the camera is designed for ASA 50 or 100 film, and might explain why there seem to be an awful lot of blown highlights in Holga photos. For black and white I used Ilford HP5, although I mostly used it with the flash. 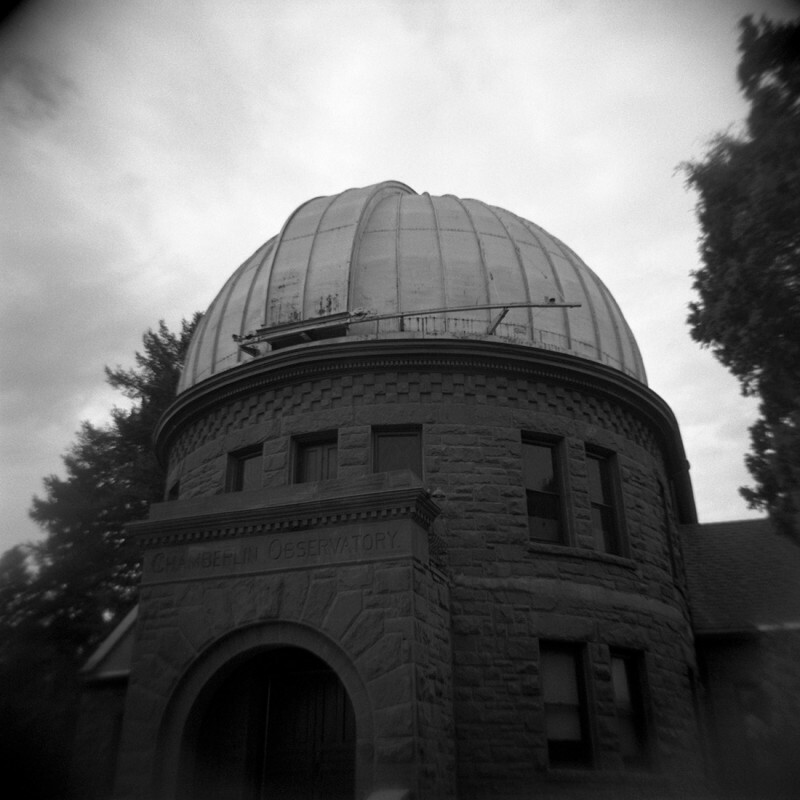 You can see in the above photo that the observatory is a little over-exposed — it probably would’ve been much worse if it hadn’t been an overcast day when I took that. Of course it would’ve left the stone building face pretty dark, too. The 120 CFN takes 120 film (the “120” in the designation is your first clue…), as most Holga models do. Of course, it’s very popular to modify it for 35mm film (“Sprockets!“), with or without one of the included masks (which snap into the light box to switch between 6×6 or 6×4.5 centimeter vertical frames). Using 35mm film will require you to black out the ruby window on the back of the camera since 35mm has no backing paper. You’ll also have to load and unload the film in a darkroom or changing bag. If you skip the mask, there’s also a gap you’ll need to tape up between the light box and the take-up spool, lest light spill in there and fog earlier exposures. You’ll also need some packing peanuts, foam scraps, or something else to keep the 35mm cassette centered and in place on the supply side of the camera. And you’ll have to count the clicks the knob makes to advance the film, which is a complex dance you can learn more about from Photon Detector. There are Holga kits available that omit the ruby window and mask the film to make normal 35mm frames, or you can DIY something. I haven’t actually tried any of this yet, but maybe someday. There’s a switch, by the way, on the ruby window. It covers one set of numbers and displays the others, selecting between “16” and “12” markings — 6×4.5 and 6×6, respectively — for the different masks. The lens is plastic, a feature so fundamental to what the Holga is all about that it’s advertised right on the box in most cases. It has a 60mm focal length, which is fairly wide for a medium format camera — about the equivalent of a 35mm lens on 35mm camera. That said, there is a glass lens version available — but why would you want that? As stated before, and again fundamental to the design, the lens produces heavy vignetting. Very. Heavy. Like stacking 6 filters on your 35mm SLR’s wide angle lens. Maybe 7 filters. Seriously. Heavy. Vignetting. Given the apertures available, your depth of field is pretty high and so focus shouldn’t be terribly important. It seems to me that you’re more likely to see motion blur in your pictures, especially if something is moving. Either way, if you’re after sharpness, look elsewhere. 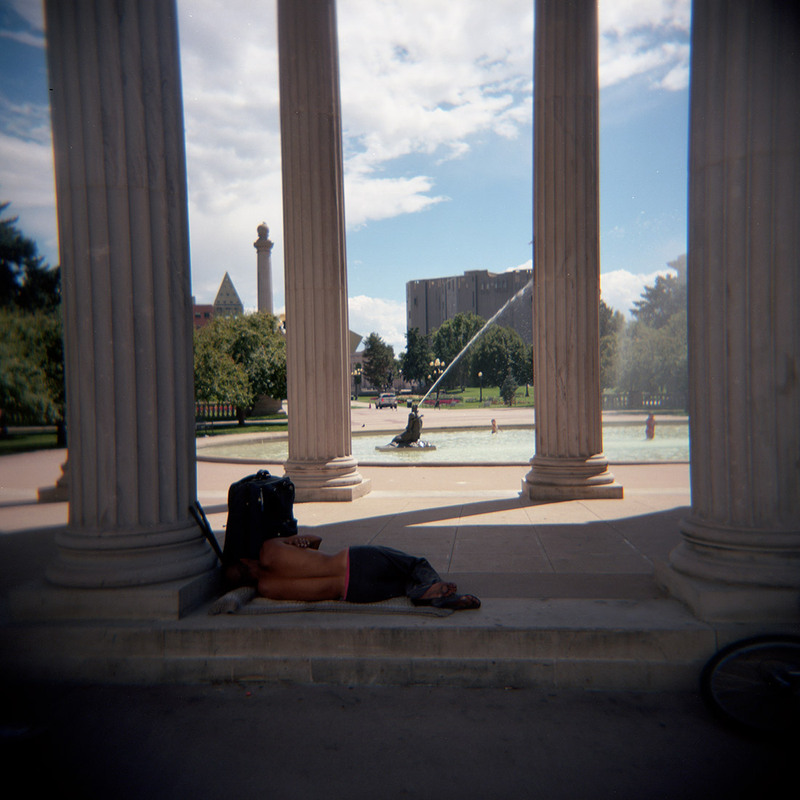 A Holga is a sharpness junkie‘s nightmare. Now, all those features are standard to any Holga model with “N” in the designation. Actually, that’s just for the two-speed shutter, I think. Or the dual aperture. It’s all a might confusing. Where this model gets special is with the “C” and “F” in the designation — for Color and Flash. “Colorflash” is what they call it, actually. It has an integral flash built into the top of the camera. It takes two AA batteries, which load into either side of the light box inside the camera; the masks hide them from view. They fit far forward, just behind the lens, so they’re well out of the way of the light path. The color part is a rotating 4-color gel wheel that allows you to use the standard white light, or choose red, blue or yellow instead. These gels won’t make a whole lot of difference with black and white film — a little, sure, particularly in terms of dropping the light produced by a half stop or maybe a full stop — but with color film they can completely change the character of an image. I’m sad to say that I’m not sure where all my colored flash photos went, as I do know I turned the little knob on top to try each color a couple times. I think the picture below, of Safe Boating bassist Neil McCormick, was taken with the red gel on. Maybe. Beyond those technical things, the Holga has some very basic standard-ish features: a tripod thread on the bottom, a simple viewfinder, a film advance knob. The shutter is a simple rotary affair and the lens is a simple meniscus. There’s no double-exposure prevention or check battery light. It’s only one notch above a box Brownie in terms of complexity. Holgas aren’t as cheap as they probably should be, frankly — it’s a $5 camera. Maybe a $10 camera. But depending on the model and the included accessories, they can range anywhere from $30-100. Part of that is probably a hipster tax, since Holgas are in right now. It’s also probably worth noting that these things are all heavily modifiable — to the point that there’s a whole website devoted to ways you can bend your Holga to your will: holgamods.com. You can add a Polaroid back, put in a pinhole, use a serious lens, add a self-timer — all kinds of stuff. It’s a cheap, plastic camera, so have fun with it! 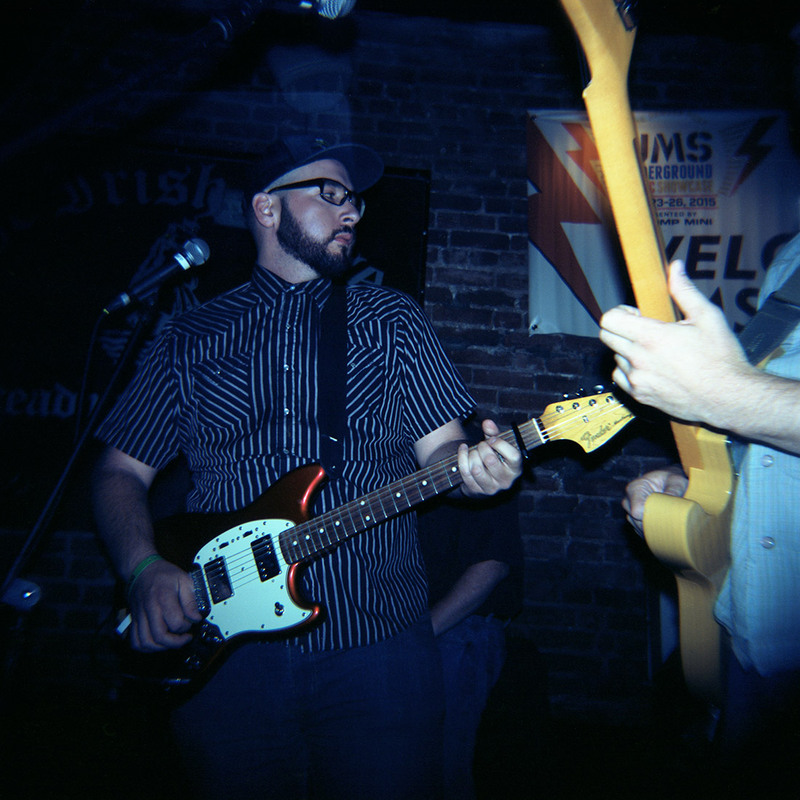 The Holga was fun. Honestly, it was. So any negativity you’re about to read should be taken in that context — these are just the complaints and observations I had while using the camera, and anything I haven’t mentioned was just fine. It feels really plasticky. Okay, that was just a cheap shot — I don’t like when a camera meant to be a serious photographic tool is plasticky, but it should be obvious that a Holga would be. It does have a certain cheapness to it, though, that goes past being quirky or endearing. The thin, stamped clips that hold the back on, and to which the strap affixes, have a tendency to pop off completely sometimes. If this happens with film loaded, you could lose the whole roll — not just to fogging or total exposure, but really lose it (if you happen to be standing over a storm drain or some other oubliette of civil engineering) — because there’s not a lot holding the film in there. I asked this because I blindly followed the Holga book that came with my camera, making an electrical-tape flap over the ruby window that could be lifted for advancing the film and stuck back down in between. I even made a little tape tab to make it easier to lift up each time. Unfortunately, the flap wound up getting repeatedly mangled when I moved the camera in and out of my bag. Overall the flap proved somewhat frustrating and left me wondering if it was strictly necessary. Is the ruby plastic too transparent? Enough to fog the film, even with the backing paper in there? I found the ruby window selector switch initially confusing, too. I know that 6×6 frame numbers tend to wind up in the vertical center of the camera, typically, and yet I wasted a roll of film using the 6×6 mask and the 6×4.5 frame count. The thing is, the little switch that covers half the window has an arrow which points to the number of frames expected. For some reason, I think I subconsciously expected the number next to the exposed portion of the ruby window to match the expected count. My mistake — totally — but a result, I think, of slightly confusing design. Then again, it’s a mistake I won’t make again. I think I got to about frame 15 before I realized that either I’d messed it up, or gotten one of those magical extra-long rolls of film (that’s a joke — there’s no such thing unless you count 220 film, which has no backing paper in the middle and therefore no frame numbers). Before you ask, I accidentally exploded that roll of film unloading it and exposed it all, so it wound up in a trash can somewhere in Denver. The Holga’s extreme simplicity does make it quick and easy to operate once you’re used to it. Its simplicity is a limiting factor, too, though — you can’t expect a lot in low light that isn’t low enough to require a flash. Even one more shutter speed option, like 1/30 sec., would go a long way toward beefing up its versatility. You’d think it would be great for something like lo-fi street photography, but you might be wrong for one reason (with three causes): It’s loud! I’m amazed by how much noise its tiny rotary shutter can make, actually. It’s louder than any of my box cameras by 10-15 decibels (according to a free dB-meter app I downloaded), and is clearly audible on the busy 16th Street Mall from 15 feet away. Compared to the near-silent Olympus 35RC, it’s like a cannon going off. This isn’t so much a complaint as it is a remark on how surprising I found the shutter’s volume. Rather than springs to hold the film tightly against the take-up spool, the Holga uses little blocks of open-cell foam. The spongy grey mass squeaks — distinctively and loudly — when you advance the film. I don’t know if this is something that will break in with time and get quieter, but I’ve put a half dozen rolls of film through mine and it’s still plenty noisy. The distinctive ratcheting sound of the film advance, too, destroys any stealthiness you might think the Holga is capable of. Of course, without its measured clicking you wouldn’t be able to advance 35mm film in an informed way. And if you remember the number of clicks between frames on whatever format you’re using, you can advance in the dark, which I found helpful at the Hi-Dive during the UMS. So it’s questionable how possible it would be to use the Holga in a way that even remotely mimicked surreptitiousness. It’s still quieter than the Pentax 6×7, of course. Looking at my frames, I noticed one other thing — look up at the photo of Strawberry Runners at the Hi-Dive. There’s a weird, huge light leak when I use the flash. It’s made a strange triangle shape in the upper-left quadrant of the frame, sharp on two sides connected by a rounded corner, and fuzzy along the third side. I saw this in several frames that used the flash. 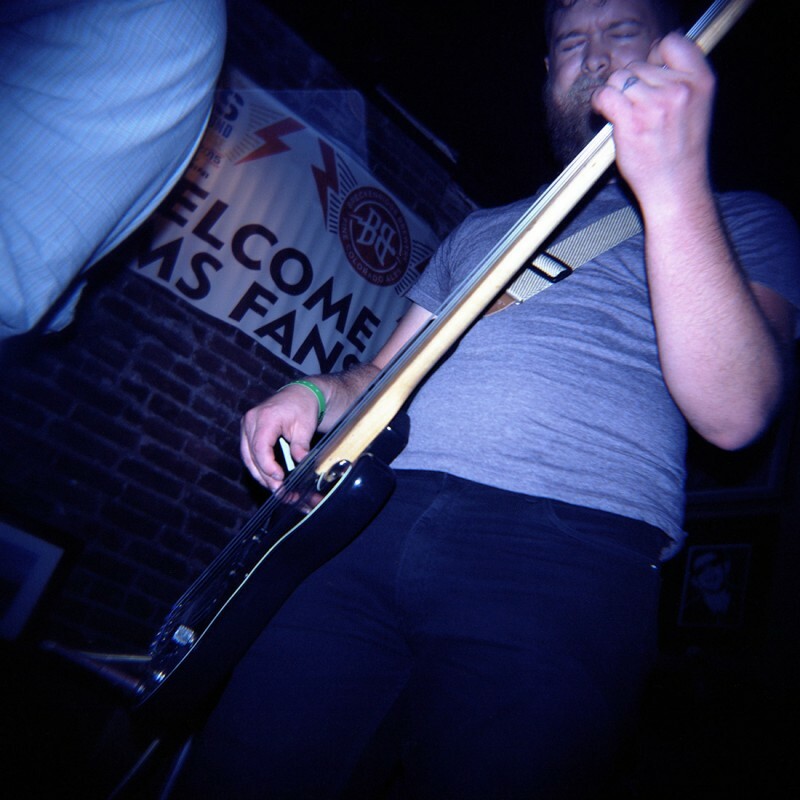 I don’t mind — it ads to the lo-fi appeal of the Holga’s images — but it’s consistently there and doesn’t have the occasional and unpredictable qualities that make light leaks endearing in a lot of plastic cameras. 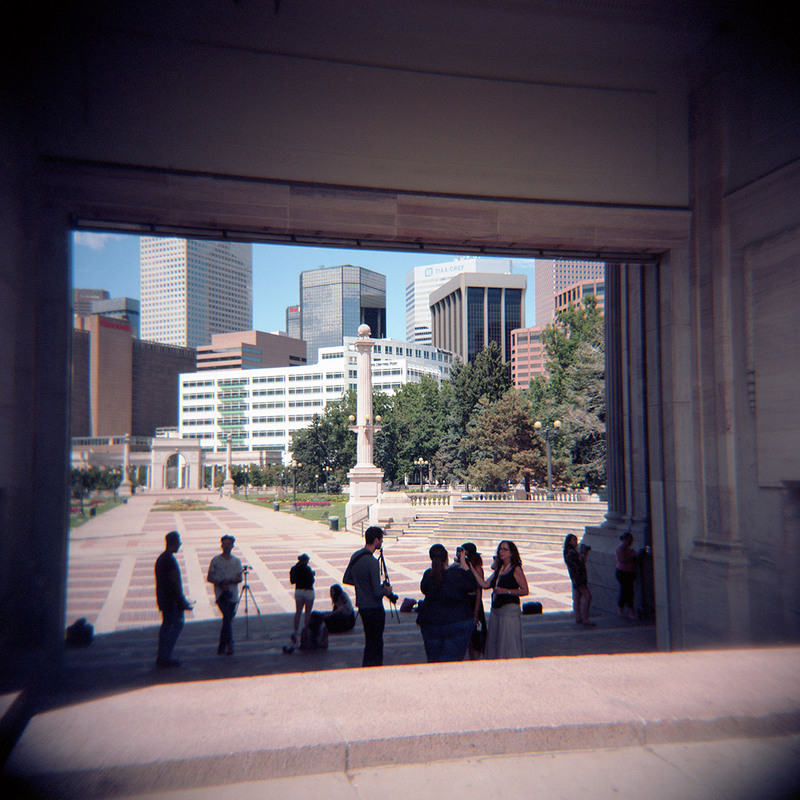 I could probably figure out where it’s coming from and fix it with a little electrical tape if I use the Holga again. The lens is reasonably sharp in the center, falling off evenly as you approach the edges. In that way, it reminds me of the Imperial Debonair I tried a few years ago. In some photographs it even gives a strange sense of motion. Look at the one below — I almost feel like it was taken while running toward the flower bed rather than standing still. Overall, I’m going to give the Holga 3 out of 5 stars — all three are for being fun, though. I’d give it more for the characteristic images it produces, but I think you can get very similar lo-fi qualities for less money and increase your overall ease of use. A “new color optical lens” camera (magazine subscription type) or a cheapo box camera should provide every bit as much fun and similar quality with less mental exercise, and do it all for just a few bucks. Still, the Holga was enjoyable and succeeded spectacularly at being just what it is. Unfortunately, it just isn’t that much.